It is simple and has been around for a long time. Microsoft Paint is an effective and surprisingly powerful tool for the classroom. There are many more capable graphic editors and drawing programs available. But Paint is free and available as it is found in every Windows Start menu in the Accessories folder. It’s also easy to learn and use, and it has the basic tools needed to draw, color, and edit. See the step-by-step instructions below to get to know the Paint tools. 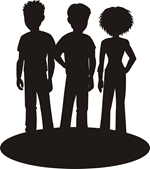 Then try a fun, creative drawing assignment from TechnoBudget. Get elementary or middle school students thinking and drawing. 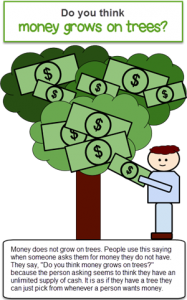 Use Paint to illustrate a money idiom. The literal meaning of the saying is painted in the picture while the real meaning is explained in a text box. Try it out! Here are some money idioms to get your students started. Pick one and illustrate it! Open Paint. Paint is included with the Windows operating system. It can be found by typing Paint into the search box on the taskbar, or under Accessories or Windows Accessories in the program listing. Click Size. Choose a line size. From the Colors group, click the Color 1 box. Pick a color. Click and drag in the drawing area. Click Brushes in the Shapes palette. Pick a brush option. Choose a size and a color. Click and drag to draw. Experiment with the other brush choices. Click Line in the Shapes palette. Click and drag to draw a line. Press the SHIFT key to make it straight. Select the line. Press the DELETE key to remove it. Click Curve. Draw a line on the canvas. Click on the line and drag to bend it. Click and drag to draw a line on the canvas. Click at different spots to draw the polygon sides. Click again on the start point to draw a filled shape. To fill the shape with color, click Fill with color. Pick a color. Click inside the shape. Choose a Shape from the Shapes palette. Click Outline to pick an outline style and click Fill to pick a fill option. From the Colors group, click the Color 1 box. Pick a color for the outline. Click the Color 2 box. Pick a fill color. Click and drag to draw the shape. Drag a corner handle to change the size. Note: Once you have clicked OFF a shape and it is not selected, you cannot make any changes to it. Click Undo. Your last action will be cancelled. Click Eraser. Click Size and pick an eraser size. Click the Color 2 box. Pick white. Click and drag to erase. Click Select. Draw a box around the part of your drawing you want to erase. Press DELETE on the keyboard. Click Text . Click and drag to draw a box. Drag a corner handle to alter canvas size. Magnify an area using Zoom. Undo or Redo an action. This assignment is an extension activity from the technology project TechnoBudget. Teach personal finance. Middle school students budget for a shopping spree and justify a spending plan using Google Sheets or Excel lessons. Develop financial literacy and money management skills. 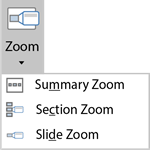 In my previous post, I listed the steps to create a zoom to a slide using the Zoom Tool in PowerPoint 2016. Don’t confuse this, as I did at first, with the zoom slider in all Microsoft programs that lets you change the magnification of your window. This is entirely different. The Zoom Tool automatically creates both a thumbnail of a selected slide and a link to that slide. Put these thumbnails on a title slide or any other slide to quickly and easily make buttons to link to slides in a presentation. To make a Slide Zoom in a shorter presentation, see Zoom Tool in PowerPoint for Awesome Presentations Part 1. For longer presentations with many slides, you can organize the show into sections. First, group slides into categories and make separate sections. Then create a Section Zoom to link to each section. In this way, you can adjust the presentation for different audiences, easily navigate to different sections depending on viewer questions, or just go to specific sections to modify the presentation. Section Zooms are ideal because, after viewing each section, the user is taken back to the slide with all the Section Zooms. Decide where you want to create a section. Right click between two slide thumbnails. In the Rename Section box, replace Untitled Section with a name for the section. Click Rename. Continue to divide the slide show into sections, renaming each section. Click the View tab, and pick Slide Sorter. View thumbnails of all of your slides organized into sections. 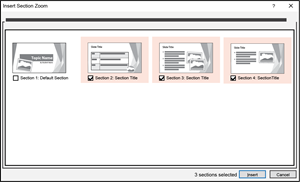 In Normal View, select the slide where you want to create the Section Zoom, most likely the title or a table of contents slide. Click the Insert tab and pick Zoom. In the Insert Section Zoom box, check each section to which you want to create a link. Click Insert. If you want to change the appearance of the Section Zoom thumbnail, go to the Zoom Tools Format tab. Use the preset Zoom Styles or make your own style using the Zoom Border, Zoom Effects, and Zoom Background tools. You can even right click a zoom image and pick Change Image to replace it with an image or icon of your choice. Read my previous post about the Zoom Tool to see a listing of the Zoom Tools. Whether you have sections or not, this option creates a new slide. It places zooms of all of the sections on the new slide, similar to a table of contents or landing page. You can also choose to have all the slides or just some of the sections on this new slide. If the presentation has animations and timings are set to advance slides automatically, a summary zoom will play each section and then automatically go on to the next section that you’ve picked. This is a great option for a kiosk type of display. From the Insert tab, pick Zoom. The Insert Summary Zoom box opens with each section preselected. (If you have no sections, you will have to choose which slides you want to zoom.) You can keep all the selected sections or you can choose to just pick the sections you want. Be sure to keep the checkmark on Keep unused sections in your presentation. Click Insert. A new slide and section named Summary Section is created with zooms to each selected section. Resize or format the zoom thumbnails as desired using the Zoom Tools Format tab. 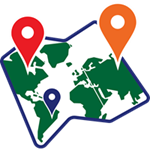 TechnoMap is a technology project that teaches map skills using PowerPoint. Students create an interactive map of a location, connecting places with events, issues, or people. In this project, students use Zoom to link markers on a map to slides explaining the significance of each area. Learn more about TechnoMap here. Slide Zoom is a new PowerPoint tool that can make any slide show into an interactive, non-linear, and engaging presentation. It’s also an easy way to make links in a presentation look professional. Use the Zoom Tool to navigate through slides in any order. Or, if you’re designing a presentation for use in kiosk mode, where users play the slides themselves, Slide Zoom allows you to effortlessly organize how they will experience the show. When you create a Zoom in PowerPoint, you make a link to a slide. For example, on a title page you may choose to have a number of links to different slides in a presentation. For different audiences, different topics, or to have flexible ways of navigating through a slide show, the Zoom Tool allows you to make thumbnail versions of slides on the title page. These thumbnails are also actual links or buttons to connect to the slides. Here’s how to make a link on a PowerPoint title page to other slides in the slide show. 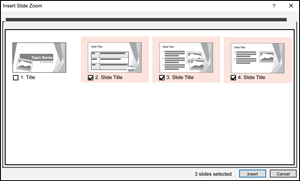 Open a slide show in PowerPoint. You should have a minimum of three slides. On the Insert tab, click Zoom. Select Slide Zoom. The Slide Zoom dialog box opens. Select the slides in the presentation. Click Insert. A thumbnail of each of the slides appears on the title page. These are the Slide Zooms. Move and resize each thumbnail to arrange them on the title slide. Select a Slide Zoom. From the Zoom Tools Format tab, click Return to Zoom. Check Return to Zoom for the other Slide Zooms. Change Image – Swap the slide thumbnail with a picture file, online image, or icon. Duration – Set the length of time it takes to zoom from one slide to another. Zoom Styles – Apply a style to the Zoom. Zoom Border – Customize the outline color, weight, and dash style. Zoom Effects – Add effects such as a reflection, glow, or shadow to a Zoom. Zoom Background – Show or hide the frame of the Zoom. Click Slide Show in the taskbar to view the presentation in full screen mode. Click on any of the slide thumbnails to go directly to that slide. Click on the title slide (not on a slide thumbnail). You will notice that you are able to see the next slide. You need to fix that! Exit Slide Show view. Click the Transitions tab. Remove the checkmark from the On Mouse Click box in the Timing group. Now view the Slide Show again. You should be able to click the title slide and it not advance. Slide Zoom is a nifty tool to easily make navigation through a slide show dynamic and unique. Use it in any slideshow that doesn’t require the viewer to follow a linear or predetermined path through the slides. Create Zooms for each slide on the title page so viewers can move through the slideshow in any order. Make a slide with a diagram of the human body. Create additional slides explaining each system of the body, for example circulatory, respiratory, digestive etc. On the title slide, insert a map of a country, region, or any area under study. Make slides that allow a viewer to learn more about the place such as tourist attractions, physical features, ecosystems, capital city, endangered areas, economic resources etc. Create a title slide with an image of the solar system. Make separate slides for each planet or space phenomena such as comets, asteroids, and meteroids. Make a title slide with a picture of a plant or animal. Create slides that describe the parts of object and explain their function or importance. Create a title slide using SmartArt that outlines a process. For example the life cycle of a butterfly, stages of manufacturing, or water cycle. Design slides to provide details about each stage. In my next post about the Zoom Tool, find out how to make a Section Zoom and a Summary Zoom. TechnoMap is a technology project that teaches map skills. Students create an interactive map of a location, connecting places with events, issues, or people. In this project, students use Zoom to link markers on a map to slides explaining the significance of each area. Learn more about TechnoMap here.